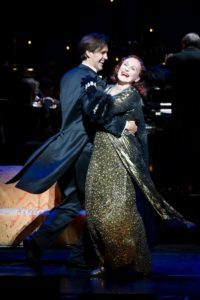 In today’s Wall Street Journal I review the Broadway transfer of the English National Opera revival of Andrew Lloyd Webber’s Sunset Boulevard, starring Glenn Close. Here’s an excerpt. “Sunset Boulevard,” Billy Wilder’s noir-flavored 1950 screen melodrama about a forgotten silent-movie star turned mad murderess, is back on Broadway. So is Glenn Close, who played Norma Desmond in 1994 but has mostly steered clear of the stage since then. Now that her film career is quiescent, it makes sense that she should return to Broadway in one of her most celebrated roles. The catch is the show itself is unworthy of the classic picture on which it is based. Mr. Webber, however, decided that his kind-of-sort-of-classical style was equal to the task. So did the English National Opera, where this revival, directed by Lonny Price, originated. It is not, however, a full-scale blowout but a scaled-down, semi-staged production of the kind in which Mr. Price specializes. The directorial conceit of the revival is that the action takes place in the mind of Joe Gillis (played here by Michael Xavier), the failed screenwriter turned kept man who narrates “Sunset Boulevard.” To this end, it is played out on a stylized Hollywood soundstage and accompanied by a 40-piece onstage orchestra. That’s a smart idea in theory, but the placement of the orchestra makes the playing area so shallow that the show looks cluttered…. More to the point, “Sunset Boulevard” needs to be mounted on an operatic scale in order to be effective. Shorn of the blank-check spectacle of Trevor Nunn’s original production, it has nothing to offer but its gooey score, which softens and sentimentalizes Wilder’s brutal satire of golden-age Hollywood and its callous ways….